Non-fiction – paperback; Granta Books; 163 pages; 2004. 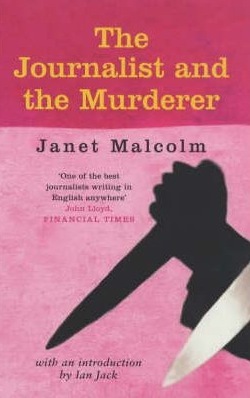 Janet Malcolm’s The Journalist and the Murderer famously caused an outcry within the media when it was first published as a two-part article in The New Yorker in 1989. Its oft-quoted opening sentence — “Every journalist who is not too stupid or too full of himself to notice what is going on knows that what he does is morally indefensible” — seemed to lay down the gauntlet, calling the ethics of journalism into question. But Janet Malcolm is a journalist herself and so the book must not be condemned on the basis of this first line, nor should it be viewed as summing up the author’s views. Indeed, it becomes clear upon reading The Journalist and the Murderer that Malcolm has mixed views about her profession, which I’m sure is true of most journalists today, myself included. What this book really examines is the relationship between journalists and sources in the context of non-fiction books and the difficulties which face both parties. While the journalist must remain impartial in order to render the truth, he must do whatever he can to convince his subject to be frank and open with him. Meanwhile, the source must come to trust the journalist enough to share his or her most intimate secrets. Such unspoken rules are fraught with difficulty, because what happens if the journalist writes something that upsets the source but which he knows is correct and truthful? Most journalists would say that they are only doing their job – and that’s the view I take, too. But what if the situation was slightly more complicated, and the journalist agreed to write a book about the source and was given unparalleled access to him and his closest family, friends and colleagues? The dynamic might change, a close friendship might result, but surely the journalist still has a job to do and is honour-bound to remain objective and to write events as he sees them? After all he’s not in the business of writing flattering, gratifying portraits (unless, of course, that’s the “truth”), because he’s not a publicist but a journalist. Tricky, isn’t it? And even more so if the source doesn’t quite understand the rules of the game and mistakes the journalist’s so-called friendship for a genuine intimacy, when it’s essentially a means to an end: the journalist has wooed the source in order to extract information. Interestingly, Malcolm calls sources “victims” but she also points out that far too many “victims” are willing ones. Something seems to happen to people when they meet a journalist, and what happens is exactly the opposite of what one would expect. One would think that extreme wariness and caution would be the order of the day, but in fact childish trust and impetuosity are far more common. The journalistic encounter seems to have the same negative effect on a subject as the psychoanalytic encounter. The subject becomes a kind of child of the writer, regarding him as a permissive, all-accepting, all-forgiving mother, and expecting that the book will be written by her. Of course the book is written by the strict, all-noticing, unforgiving father. Malcolm really gets to the heart of this very thorny issue by examining the famous lawsuit between a convicted murderer, Jeffrey MacDonald, and a journalist, Joe McGinness, who wrote about the crime. MacDonald, a United States Army doctor, was accused of murdering his pregnant wife and their two infant daughters in 1970. Before the case had come to trial, McGinness, a hugely successful non-fiction writer, had secured MacDonald’s co-operation in turning his story into a book on the condition that he would have complete editorial freedom. He also made arrangements to sit in on the trial, was given full access to McDonald’s legal team and even lived with defense counsel and the accused during proceedings. The book was published under the title Fatal Vision in 1983 (admittedly I read it when I was in my late teens) and turned into a TV mini-series starring Karl Malden in 1984 (I think I probably watched that too, but I couldn’t be sure). MacDonald’s misguided belief that the book would exonerate him in the eyes of the public did not come to pass. Instead, Fatal Vision states that MacDonald’s guilty verdict is the correct outcome, describing him as a “womaniser” and “pathological narcissist”. It even goes so far as to purport a motive for the crime: MacDonald killed his family in a fit of psychotic rage caused by amphetamine use. A writ claiming McGinness had breached his contract was duly served, and it is this case, later settled out of court following a mistrial, which Malcolm dissects using actual court transcripts and her own behind-the-scenes interviews in The Journalist and The Murderer. It is absolutely fascinating reading, if only to see the duplicit lengths that a journalist will go to to get his story. And it would seem that the “morally indefensible” act to which she refers in her opening sentence is not about journalism per se but to McGinness’s betrayal of his source: pretending that he believed MacDonald was innocent long after he became convinced of his guilt. This sounds fascinating! I remember the Fatal Vision miniseries–I watched it, and my dad had the book, which I might have read bits and pieces of. I wasn’t aware of the controversy surrounding it. This also makes me think of Truman Capote’s work in writing In Cold Blood. His close relationship with one of the killers complicated the whole situation, but the resulting book is a masterpiece of true crime writing. This sounds awesome. I’ve never seen Fatal Vision, but I love nonfiction that explores issues like this. I like that quote a lot too, from my experience it’s mostly true — people open up to you after just a little while and share a lot of information they might not normally share. It’s odd, but also cool. I love Janet Malcolm’s books, and funnily enough I ordered this a week or so ago. I was looking forward to it in any case, but your enthusiastic review has certainly boosted it up the pile. This sounds quite fascinating. I don’t recall the book or miniseries of Fatal Vision, but, the questions surrounding the issue of a journalist’s obligation to tell the truth, regardless of how he got to that truth and what the fall out of his reporting might be, often leads to controversy. Very interesting topic. Thank you for reviewing The Journalist and the Murderer. This sounds great. I’ve only read one Malcolm book so far (the Sylvia Plath one), but all her books sound fascinating and I plan on getting to them all. Thanks for all your comments. This is a brilliant book. I forgot to mention I read it in one sitting — I simply could not tear my eyes away from it and really wanted to know how things would turn out in the end!